Art is supposed to connect with an emotion in its audience. Some pieces are tragic, others are romantic, and some are just meant to be sad. 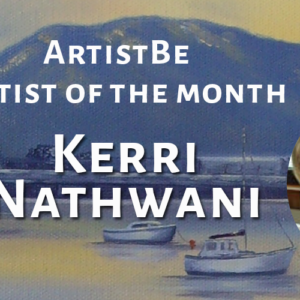 Often the most popular art though brings out the feeling of joy. There are many different subjects an artist can depict to show this emotion, but some of our favorites are the ones of children playing, alone and unaware of being captured in a painting. That kind of innocence is something special that we all long to feel again. That is why we encourage you to look at these as a possible way to bring more of that youthful happiness into your own home. 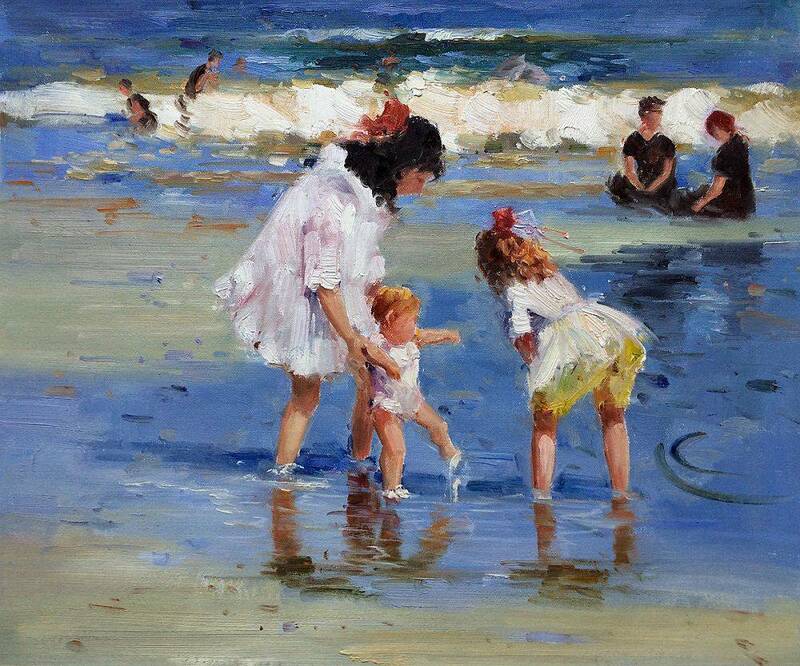 In Edward Henry Potthast’s Children Playing at the Seashore canvas, we see a lighthearted vision of young children guiding a small baby’s first steps in the shallow puddles left by the ocean’s waves. 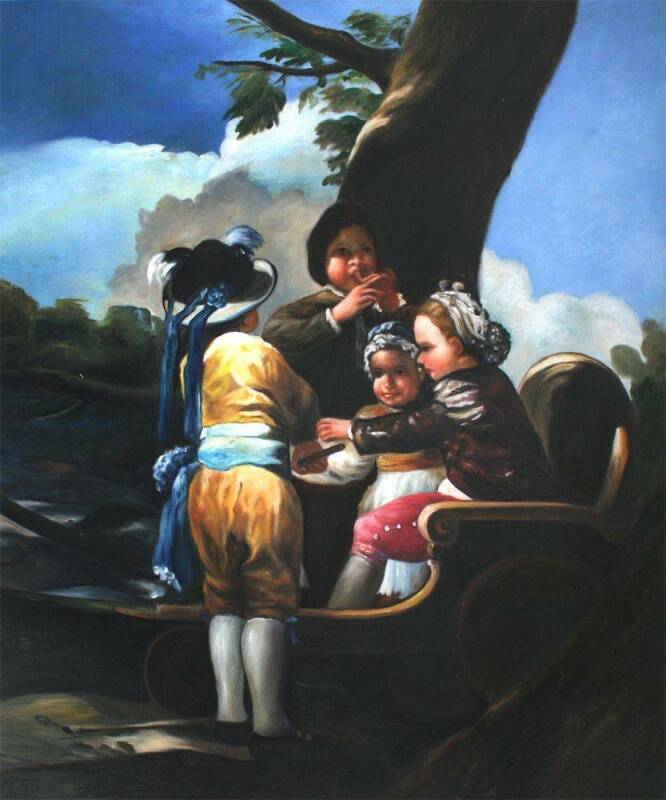 There’s a gentle airiness to the scene, balanced by the two dark figures seated in the background. With his soft wash of colors and dreamy, flowing brushstrokes, you can almost feel the warm, gentle breeze. Potthast’s Children Playing at the Seashore painting will elicit memories of childhood and carefree, relaxing summers on the beach even during the coldest winter. Considered one of the masters of portrait paintings, John Singer Sargent was adept at conveying the slightest movements and expressions of his subjects. In “Carnation, Lily, Lily, Rose,” it’s clear that Sargent carefully studied his subjects to create a vivid scene is which children are at play. 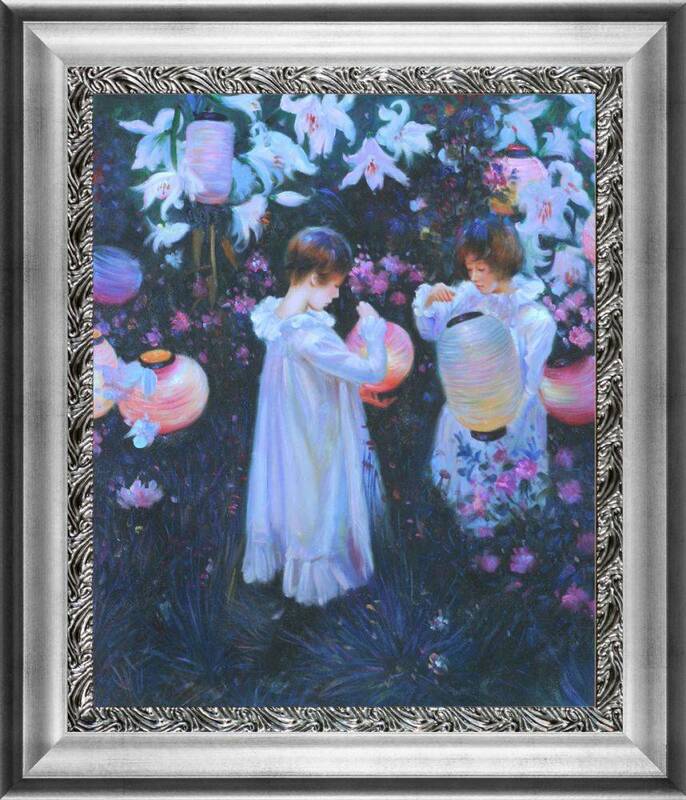 This sweet portrait shows the children with lit lanterns. The colors used create a sense of dusk just falling, and Sargent blends his Impressionist and Realist skills to create a scene that’s at once familiar and dreamy. Though technically not children, these cherubs still provoke the sentiment of youth. 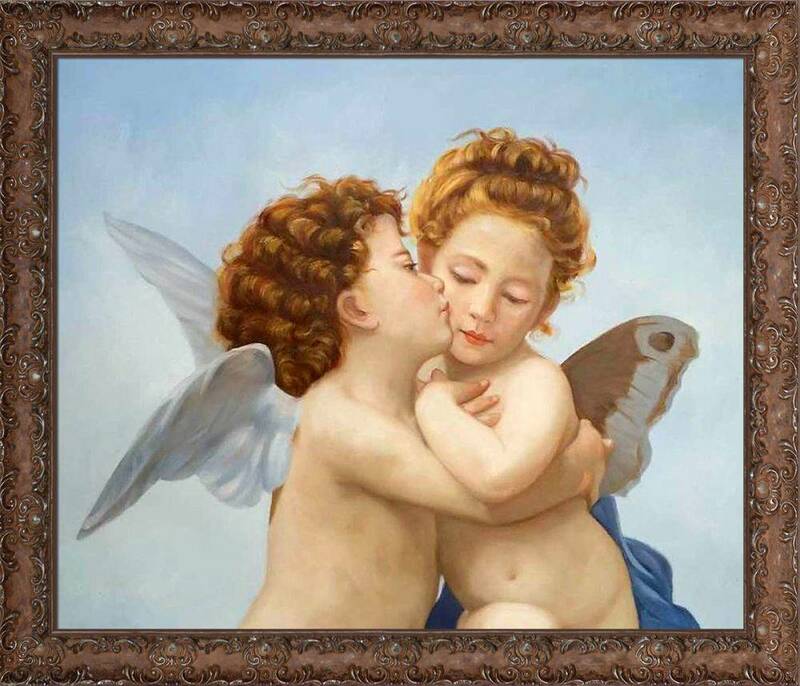 This beautiful painting depicts winged angels sharing an innocent and loving kiss. 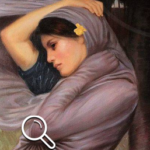 With soft colors, rounded figures and a muted background, it fits in perfectly with William-Adolphe Bouguereau’s French traditionalist style. The fact that he was able to add such a sense of realism to Classical and mythological subjects makes his work especially fascinating. You and your family won’t be able to look away without smiling. One of Winslow Homer’s captivating group interactions of kids playing, this piece shows the carefree nature of children at play. Children embodied innocence and the promise of America’s future and were a favorite subject of artists during the Civil War Period. Here Homer reminds us about rural simplicity and shows how the glow of the sun illuminates their joyful faces. This would fit in with any kind of Americana design you might have. Originally painted in 1920 George Wesley Bellows had a strong understanding of the relationship between light and dark. His painting, Gramercy Park reflects his technique of enhancing texture by using subtle contrasting to create depth within his work. 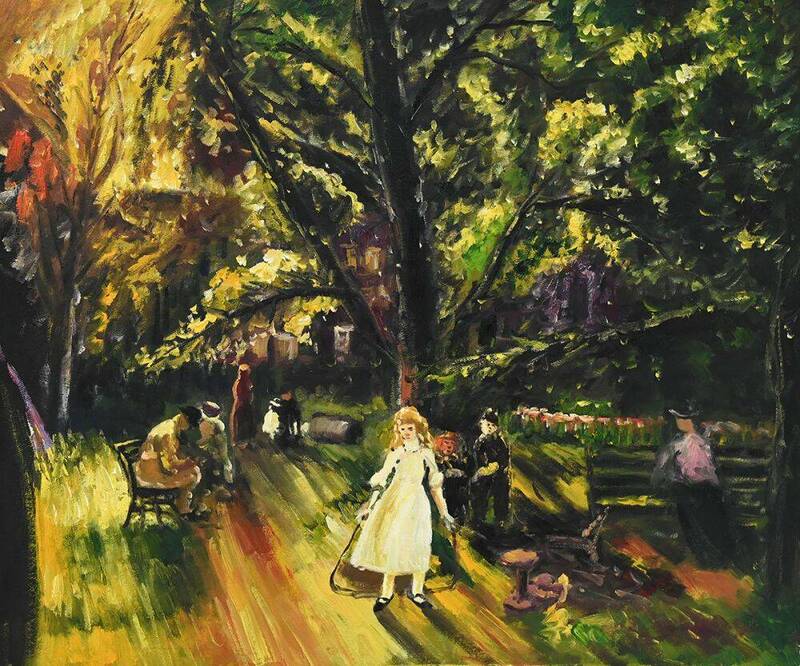 Gramercy Park is a brief moment in the life of upper middle class residents enjoying and afternoon in the park. The well-dressed children playing the foreground give it a playfulness that will be a great conversation starter in your home. 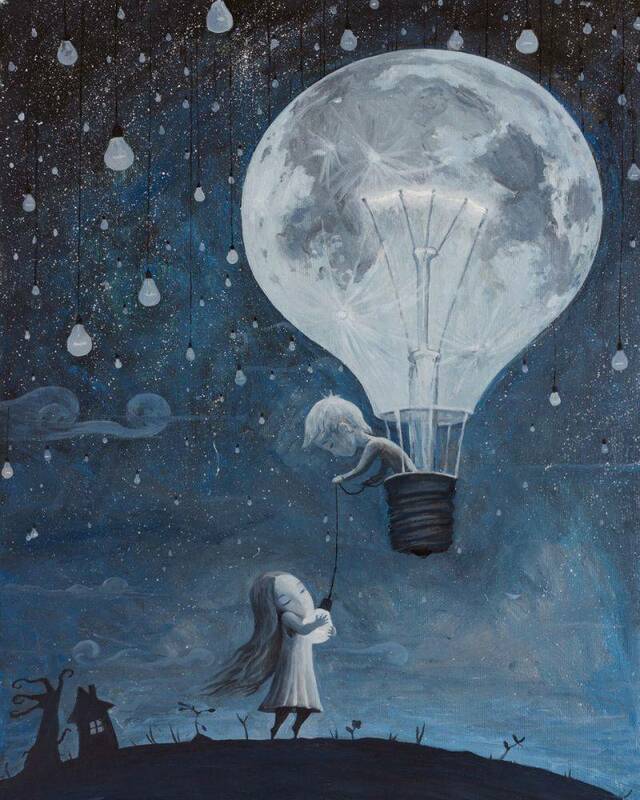 Adrian Borda gives us a dream-like image of two children playing against a night sky. They are going for a ride in a balloon that melds into the depiction of the mood. It is a calm scene that has a hint of mischief as the two of them appear to be almost asleep while they play. This would a great piece to put in a child’s room to inspire them to dream big. 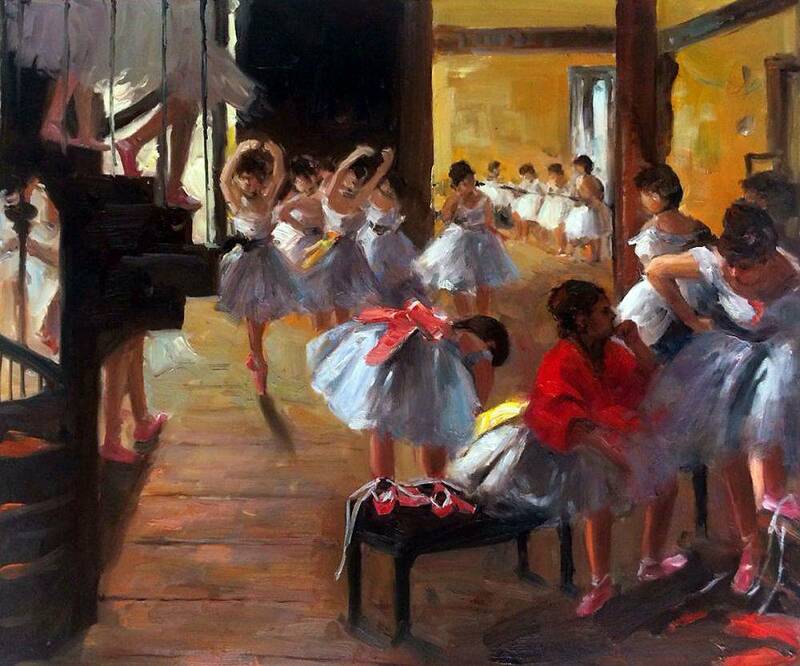 Edgar Degas was inspired by the young girls who danced in the ballet so much that they became the muses for his most famous works. The Dance Class shows us the girls’ interactions when they are not on stage. There’s a quiet chaos as dancers swirl about in preparation for the big show in this bright rehearsal space. Notice the reds, yellows and pinks that pop out and accentuate certain dancers as others climb down the spiral staircase on the left. It will capture your fascination and make you feel their excitement before performing. Francisco Goya is most well-known for his art depicting insanity and darker images that he painted while in emotional turmoil. As one of the artists in residence to the court, he also often painted subjects that were also at court during his stay. Many of those subjects were children. 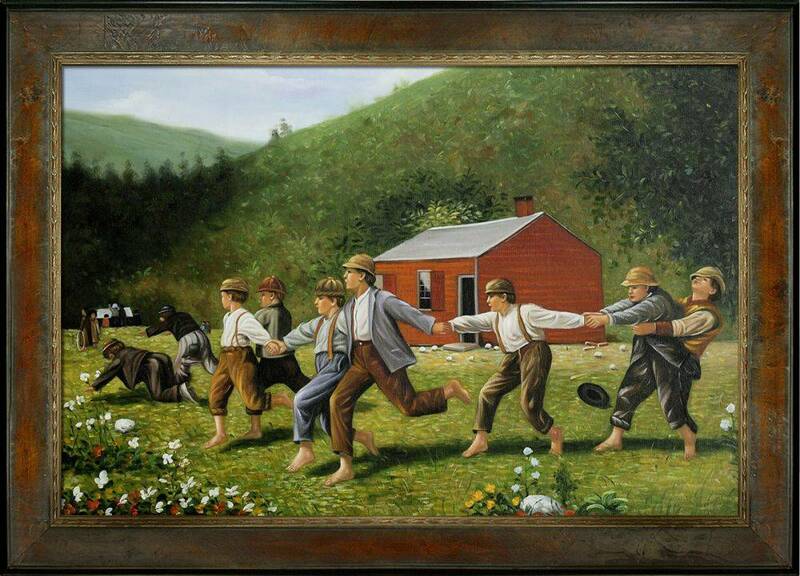 When he painted these children he often used the contrast of light and dark to portray their innocence. A piece like this would draw the eyes of your guests with the brightness of the children’s faces and the hope they held. Theodore Robinson’s work carries a unique style that combines Impressionism with realism. The subjects of his paintings are often landscapes or people in a domestic and quiet scene. In a Daisy Field is a perfect example of one of these calm scenes. 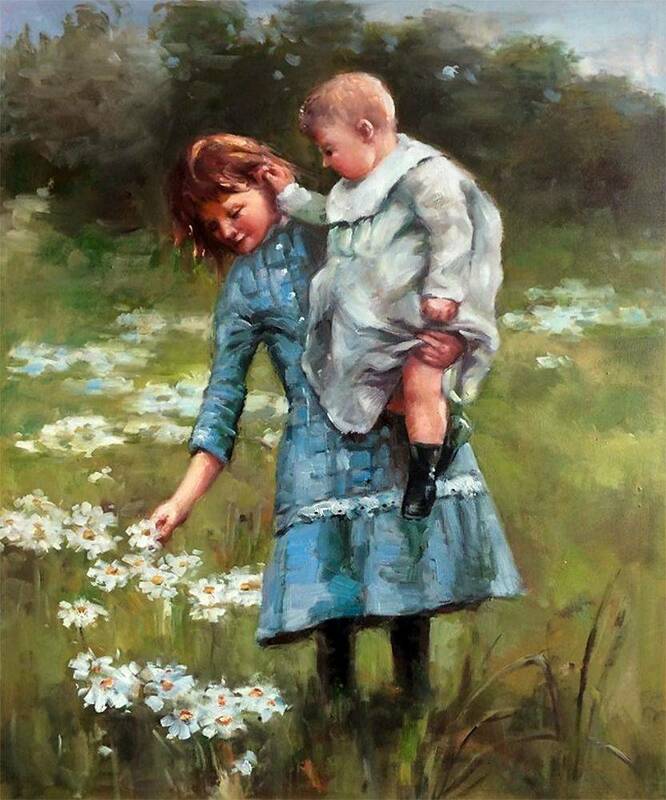 The painting features a young girl carrying an infant though a field of wild daisies. The realism and natural aspects of the scene are visible in the painting, as we can see the girl struggling to lean over to pick a flower, and the infant tugging at the girl’s ear. With the bright sunlit blue and white colors, this painting is sure to brighten up any room. 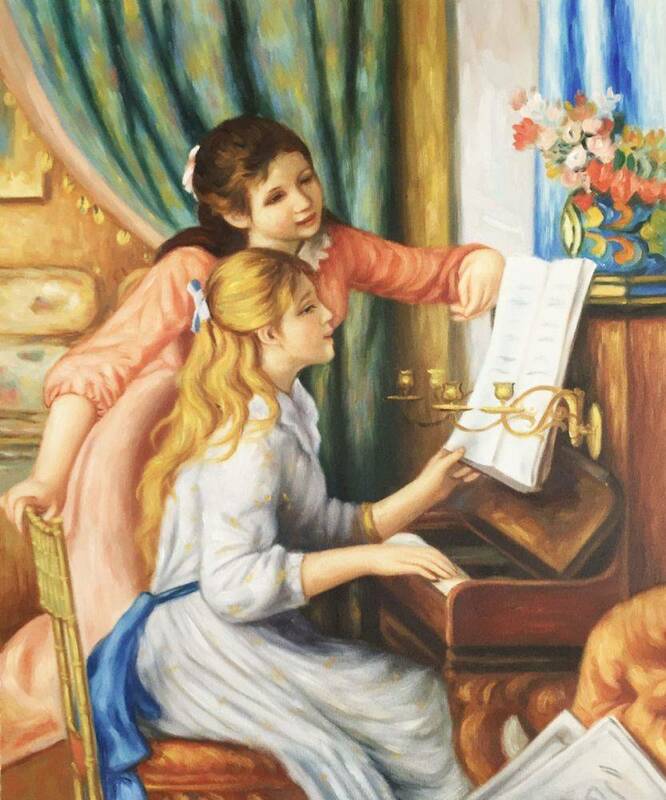 Pierre-Auguste Renoir portrays two working-class girls, one playing the piano while her friend observes. With the artist’s expert use of spacing and detail, the viewer sees their unmistakable delight in this innocent moment. Renoir’s Young Girls at the Piano depicts a playfulness and youthful intimacy that will be a great addition to your art collection. Here at overstockArt.com, we want to help you find the right piece for you home and your heart. Loving a piece of art is very personal, but we strive to offer enough selection that anyone can find what they connect to. Perhaps one of these can become part of your family.